In the middle of the preparations for our stay on Lesvos, Greece, we want to remind you that the Greek islands are not the only places in Europe where refugees are suffering the inhuman treatment by EU member states. People are suffering illegal pushbacks and police violence in many European states. Last night cops destroyed tents of migrants and refugees in Paris, France. The violent treatment of refugees and migrants is increasing across Europe. Read all our articles about refugees; here. 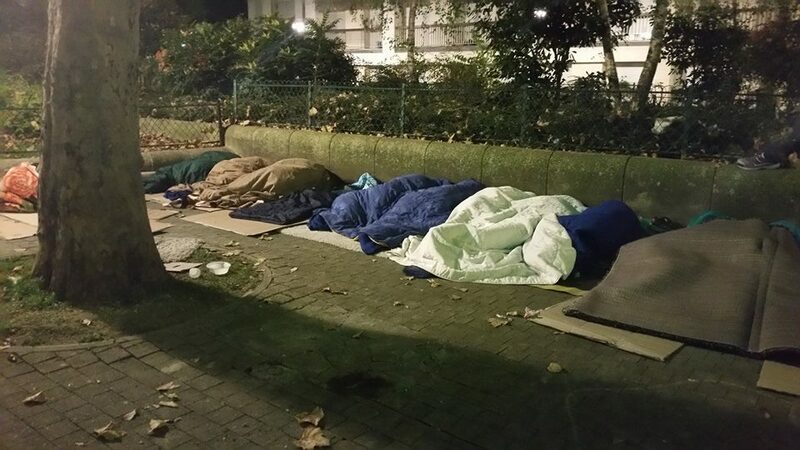 The inhumane living conditions for the people living on the streets of Paris doesn’t seem to be enough for the French authorities. As international human rights day drew to a close, this is what the Parisian authorities had to offer on December 10: Cops Smashed Tents of Refugees & Migrants in Paris. While the people on the cold streets of Paris have to face police brutality on a daily basis, the decision makers are working on new laws for stricter detention of refugees and migrants who are subject to Dublin procedures. French parliament debated a proposal permitting the detention of refugees seekers who can be transferred to another Member State under the Dublin Regulation as soon as they register their asylum application at the Prefecture. The bill already passed through the Law Commission (Commission des lois) of the National Assembly on 29 November 2017. The new law still has to go through the Senate, but that is more or less a formality. There is no doubt that he majority in the senate will approve the new law. The new law will allow the French state to detain people throughout the procedure of determination of the Member State responsible for his or her claim under the Dublin system, whereas the current state of the law would only allow detention after a transfer decision has been issued. In Calais refugees and migrants are also sleeping in small iglo tents in the cold winter. The violent treatment of refugees and migrants is increasing across Europe. On Border Violence Monitoring cases of illegal pushbacks and police violence are documented. Image: Living conditions in Subotica, Serbia, spring 2017. Image by: Rigardu. The Balkan route has turned into a Balkan prison. The militarized borders with their barbed wire and fences are being heavily patrolled and refugees and migrants are often subject to illegal pushbacks and police violence. Border Violence Monitoring published a statistical overview for the time from January to November 2017. In this overview they write: “From the start of January to the end of November 2017, a total of at least 110 incidents of illegal push-backs were reported. However, since we can only document experiences of the people we meet in person during our activities on the ground, the real number must inevitably be much higher. Also, the following statistics are influenced by dynamics in the documentation and cannot be fully representative of the phenomenon. The Open The Islands campaign published an update about the situation on the Greek islands: “The situation for refugees in Lesvos remains critical. As weather conditions worsen and winter approaches, Moria camp still ‘houses’ three times more people than capacity allows. With a capacity of around 2300 people, Moria camp now has almost 7000 people inside. From the promised 5000 transfers to the mainland until December 15th only a few hundred actually happened so far. If and how it will be possible to transfer several thousand people in the next five days is a questions yet to be answered. Image: Moria refugee camp on Lesvos, Greece. Image by Open The Islands.